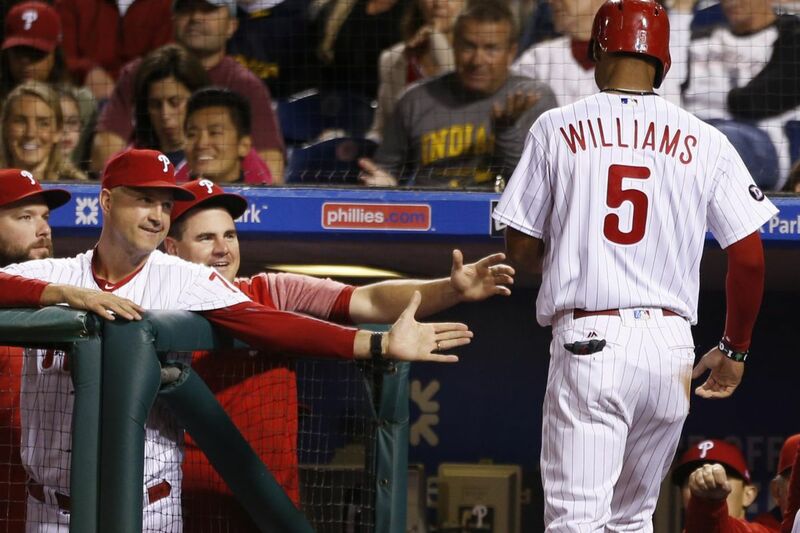 Phillies outfielder Nick Williams (right) is congratulated after scoring on a balk. While Pete Mackanin informed his team Friday afternoon that he would not return next season, Mets manager Terry Collins was readying to defend himself as he entered what is certain to be his final days as manager. The strange day at Citizens Bank Park ended with a 6-2 Phillies win over the Mets, but the game seemed secondary. The division rivals will enter next season with new managers and they will finish the weekend led by men who know they won't return in 2018. "Once the game starts, I'm managing," Mackanin said. Mackanin, who will manage this weekend before being dismissed and moved to a front-office role, watched from the dugout as Maikel Franco, Jorge Alfaro, and Cesar Hernandez homered. Ben Lively pitched six strong innings in his final start of the season and is in the mix for a spot next year in the back of the rotation. Adam Morgan pitched yet another scoreless inning and has a 0.69 ERA in his last 20 games, a span that stretches back to Aug. 2. The Phillies can end the season with a better than .500 record (38-37) in the second half if they win on Saturday and Sunday. "It was really weird and it's a little bit difficult," Franco said. "He gave us everything that he had. He is a good person and a good manager. I just want to say good luck in everything that he does." It is all but official that Collins, whose contract ends Sunday, will not return next season. The New York Post and Newsday wrote this week that the front office wanted to fire Collins in the past but he was shielded by team owner Fred Wilpon. The Post wrote that the front office thought Collins mismanaged the bullpen enough to injure closer Jeurys Familia and that players complained that the manager was not communicating. "Time to pile on," Collins told reporters before the game. Collins and Mackanin are both baseball lifers, who pined in the minor leagues before getting their crack at a major-league job. The two formed a quick friendship when their paths crossed decades ago. Collins is 68. Mackanin is 66. This is likely it for them as managers. And it seems almost fitting — even with these strange circumstances — that their tenures end together. The Phillies will play the Mets next season in Williamsport, Pa., in the 2018 Little League Classic. The game, which will be played during the Little League World Series at the tiny ballpark of the Phillies short-season single- A affiliate, is on Aug. 19 and will be aired on ESPN's Sunday Night Baseball game. It will be a Phillies home game. The Pirates and Cardinals played last month in the first Little League Classic in front of just 2,596 fans at Bowman Field. The Mets scratched Jacob deGrom from Saturday's start with a stomach illness. He will be replaced by righthander Seth Lugo, who was scheduled to pitch Sunday. Noah Syndergaard will now start Sunday's season finale. The Phillies will pitch Henderson Alvarez on Saturday and Nick Pivetta on Sunday…Rhys Hoskins needs one walk on Saturday to become the first National League rookie since Chipper Jones in May of 1995 to walk 24 times in a calendar month.